Review The NC10 is Samsung's take on the Small, Cheap Computer but unlike many 'me too' netbook competitors, the South Korean giant has clearly put a bit of thought into differentiating its offering from the other Eee-alternatives out there. Perhaps the most distinctive thing about the NC10 is its keyboard. Samsung has managed to cram in impressively large-sized keys, so unlike some models it doesn't take that long to get up to a decent typing speed. 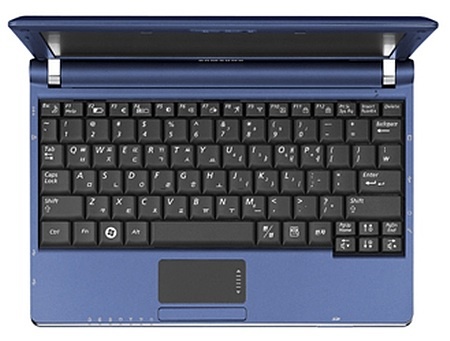 It also has the feel of a proper laptop keyboard, rather than a slimmed down one, so if you need to do a lot of typing it's ideal. That said, the space bar is a little on the small side, and the arrow keys have been slightly squeezed into the bottom right corner, but the main keys are all a good size and the layout is sensible so you shouldn't end up hunting too much for symbols. The downside of the large keyboard, however, is that there's not much room left for the touchpad. It's very small - 60mm wide by just 30mm tall - which means if you need on-screen accuracy then you're better off using a mouse, although for just moving around Windows and documents it's fine. And - let's be honest - there are very few netbooks with good touchpads - it's a weakness they all share. Another slightly usual feature of the keyboard is that it's covered with an antibacterial layer. Its coating of ionic silver particles will apparently prevent bacteria living and breeding on the keyboard, effectively eliminating 99.9 per cent of all know germs within 24 hours, according to Samsung. If you've actually managed to track back the source of an infection to a computer keyboard, then this will no doubt appeal, but we reckon it's a gimmick. 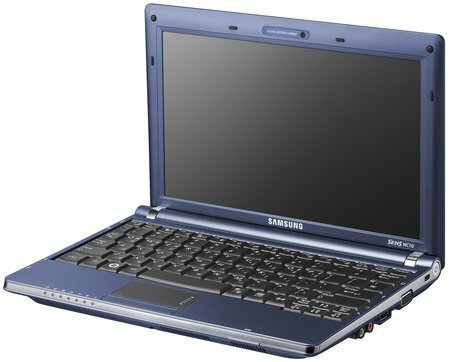 Like many machines of this size, Samsung has opted for a 10.2in LED backlit display with a netbook-standard resolution of 1024 x 600 pixels. One thing that sets the NC10's screen apart from much of its more recent competition, however, is that it's non-glossy. If you find glossy displays too reflective, then you'll be happier with the screen on the NC10.